Students and teachers at Belleville Township High School District now rely on Ruckus Networks to stay connected to laptops, tablets, and smartphones. With Ruckus Cloud Wi-Fi, the IT team at Belleville Township High School District is able to access and manage WLANs with a click of a button. 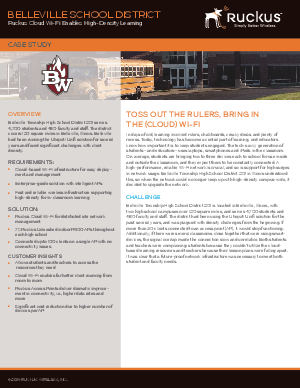 Read this case study to learn why they chose Ruckus Cloud Wi-Fi, allowing Belleville to take classroom learning to the next level.